Assets reservations system ensures that you always have enough assets for the upcoming events, trade shows, classes, projects or clients. Reserve assets that you need for the upcoming project via a web dashboard or on a smartphone. Scan assets you need to reserve or search for the assets by keywords. Get immediate feedback if requested assets are not available, and review summary reports on assets not available for all upcoming reservations. Check out assets by scanning QR code label with a smartphone. Asset reservation system ensures that correct assets are checked out, and that check out of assets that were not reserved does not interfer with the placed reservations. Reserve assets and equipment that you need for the future events, trade shows, projects or clients, and make sure you will have all required assets when you need them. Reserve assets via a web dashboard or on a smartphone. Scan in assets that you need to reserve, or search for assets by the keywords. Get immediate feedback if some of the assets requested for the reservation are not available. Update reservation at any time: change dates, requested assets and equipment, etc. You will receive an immediate feedback on assets availability for the new reservation. Cancel reservation, and requested assets will be returned to the pool of assets available to reserve or check out. Check out assets by scanning QR code or barcode label with a smartphone. Add notes or any other information if required, and obtain check out signature. QR Inventory asset reservation system ensures that correct assets are checked out. If non-reserved assets are checked out, the system ensures that there are still enough assets and equipment available for the placed reservations - if not, check out will not be allowed. 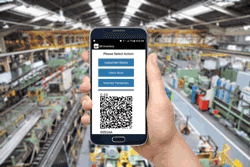 Process assets returns using a smartphone as barcode scanner and data collection tool. Scan in reterned assets, and collect any information you may need (notes, asset conditions, etc.) Take photos and attach to the transaction for visual documentation. Access real time assets information from anywhere via an admin web dashboard. See where each asset is, when is it due back, and what assets do you have on hand for check out. Check assets availability for the upcoming events. Review assets reservations, which requested assets are not available, and which assets are overdue. Access an entire life cycle of each assets (history of check outs, returns, damages, repairs, maintenance, etc. ), and more.